Some years ago I was introduced to a single Jeffrey Lewis song, "Williamsburg Will Oldham Horror," which I encourage you to listen to right now. In fact, and I feel pretty bad about this, but until recently I hadn't ever taken the time to listen to any of his other songs—as it turns out, his music is really fantastic. However, the time since I first heard the song, I've forced countless creative friends and acquaintances of mine to listen to this song during low points in their creative careers, as a way to let them know that they aren't alone. Sure, being a creative is hard and uncertain, but we all feel it. It occurred to me recently that I could probably email Jeffrey Lewis and ask him about the song, so I did. Here is the result. Paper Darts: There's something about "Williamsburg Will Oldham Horror" that's almost too true, making it enjoyable in a painful way. Did writing this song achieve any sort of important catharsis for you as an artist? 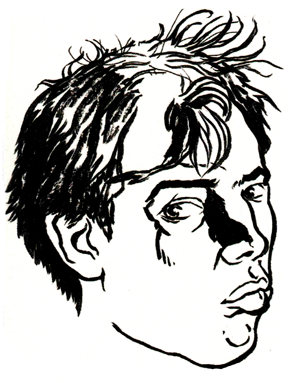 Jeffrey Lewis: All of my songs and comic books hopefully bring me to some greater understanding or appreciation or catharsis or whatever it might be…just putting your thoughts and feelings and creativity into a form in the world is an amazing experience, you can then stand back and look at it. Your mind is like a pool of mud, you can sink your hands into it and feel around but that's too blind and amorphous. It's good to reach into that shapeless swamp and bring something out into the light, as a song or a conversation or an abstract painting, whatever it is will suddenly have edges, a beginning and middle and end, a shape and a sound and a taste, so you can actually interact with it and get something back from it. And if you're lucky, or skilled, or both, then you can dredge up some shape that hopefully other people will also be able to get something out of. Pretty much anything that I put out into public means something cathartic to me (I make a lot of other songs and comics and stuff that I don't bother putting out), but it's true that certain songs resonate with more people than others. “Williamsburg Will Oldham Horror” has been a big resonator, but that might pass as the people and situations involved might not mean much to people in a few years. For myself, yes, it felt great to get all of that out. PD: Did that catharsis last? JL: Yeah, like I say, the act of making art out of thought puts things into a solid, lasting form. Thoughts themselves are just soup, but songs and art can last. Also, for that particular song, it came at a certain turning point for me. At that time I was really feeling very anxious about the fact that I seemed to have this music stuff as my job—it wasn't what I had ever intended as a job or career. I was getting into my late 20s and feeling like my life was taking a shape that wasn't what I had envisioned, wondering if that was okay. It's certainly okay to write songs about your own feelings, but is it really okay to make a living at that? To get used to making a living at it, to even expect and take for granted that there's a living to be made at it? Not just as a living, but is it okay to make a life out of it? I was able to answer some of this anxiety for myself by beginning to make a lot more art and songs about topics other than myself, it was around that time that I started working on my History of Communism series, and just generally challenging myself to expand what I could do. I still write personal stuff, but I feel a lot better with a wider range of social interaction, I feel like with people paying some attention to what I do I have more of a responsibility to put more thought into what I'm putting out into the world. I feel like with people paying some attention to what I do I have more of a responsibility to put more thought into what I'm putting out into the world. PD: I know that you also are a comic artist—between your music and your visual art, which causes you the most pain? JL: Too many different kinds of pain associated with each to really answer… not that it's all about pain or anything. Comic books are strongly attached to the pain of loneliness because of the isolated time it takes to create them. Music doesn't have that problem; it's infinitely more social. PD: Has Will Oldham heard the song? JL: Yes, and he's probably really sick of people asking him if he's heard it! I say this because with some regularity I meet people who tell me that they've asked him if he's heard it. Like, I'll play on some radio show in Germany and the station manager will say, "You know, Will Oldham played here a couple years ago and I asked him if he had heard your song about him!" Then the next day I'll do some art for a music magazine in Chicago and the editor will say, "You know, I interviewed Will Oldham last week, and I actually asked him if he'd ever heard your song!" Seriously, I think Will must really be tired of all these people who think they are the first person to ever ask him! It's been years already. Here's a funny related thing—I do have this other song that mentions Leonard Cohen, and a couple of years ago a friend of mine was on tour in a band that was opening for Leonard Cohen, traveling with him on his private plane and everything. She was going to ask him if he'd heard my song, but I think she chickened out. I should also say—I don't make a habit of writing songs about other songwriters! I think those are maybe the only two, out of hundreds of songs that I've written!